When you take a shower is it an elbow banging, sardine-stuffed-in-can, clown-jammed-into-a-Volkswagen type of experience? Maybe your shower is “functional,” but it’s not a place you enjoy. Since the bathtub is hardly ever used, showers now rule the bathroom landscape. Day in and day out they are the workhorses of our morning or evening routine. So why settle for a tiny shower which is uncomfortably small, outdated and/or a dark depressing? 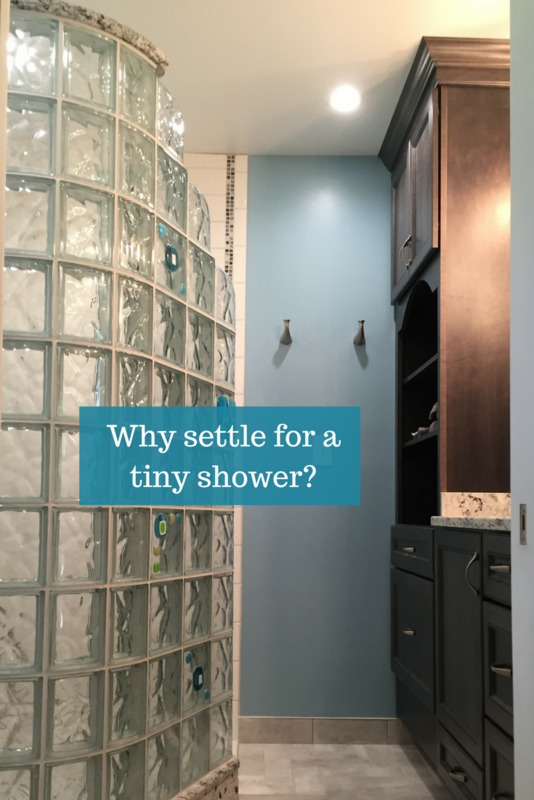 This is the question Kerry Danielsen asked about the cramped 48″ x 32″ shower in her West Winsor, New Jersey home. The challenge for Kerry (or for any of us who are adventuresome enough to embark on a bathroom remodeling project) is how can I make my limited square footage work? How can I create a bathroom which is luxurious, comfortable and durable (after all who wants to spend good money remodeling a bathroom only to see it fall apart in a short time)? Fortunately for Kerry she had a “trick” (‘er, or should I say a friend) up her sleeve to guide her through this process. This friend is also an award-winning architect (now that’s the perfect kind of friend to have during a building project), furniture designer and graduate of Carnegie-Mellon University (that’s also my alma-mater so that can’t make him too bad!). He is Jonathan Nelson. Let’s go on a journey to see how this bathroom remodeling project evolved from a good plan on a sheet of paper to a space which is not only built to last, but is built to be enjoyed …. each day.